Medicinal inorganic chemistry is a complex subdiscipline of medicinal chemistry. We discussed the pharmacology and medicinal chemistry of radiopharmaceuticals and chelating agents already. 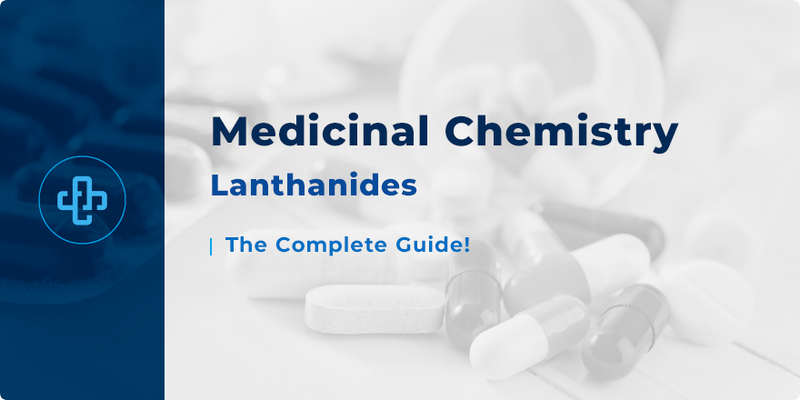 Here, we introduce you to the medicinal chemistry of lanthanoids; examiningsome clinically-relevant lanthanoid-based compounds. We have briefly introduced radiopharmaceuticals in a previous article and mentioned the use of the lanthanoid-based radiopharmaceutical, samarium (153Sm) lexidronam (Quadramet®), which bears a β-emitting radionuclide, for the alleviation of bone pain due to skeletal metastases. In this section, we will discuss other lanthanoid-based compounds in clinical use. As a compound, DOTA-TATE is a macrocycle that bears a tyrosine3-octreotate, a knownsomatostatin receptor (SSR) antagonist, and the bifunctional chelator DOTA (tetraxentan). A coordination complex with the β-emitting lanthanoid radionuclide 177Lu can be formed with DOTA-TATE. 177Lu-DOTA-TATE has been approved (Jan 2018, USA & Sep 2017, Europe) for adults with gastroenteropancreatic neuroendocrine tumours that are somatostatin receptor-positive. 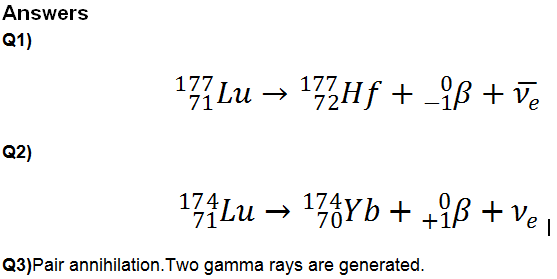 Q1)Given that 177Lu is a β-emitter, can you write a nuclear equation for the decay of 177Lu? Q2)174Lu is a positron emitter. Can you write a nuclear equation for the decay of 174Lu? Q3) What happens when an electron and a positron collide? 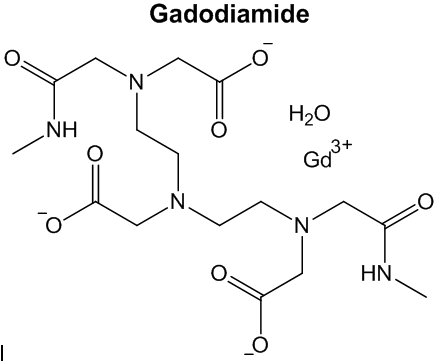 During Magnetic Resonance Imaging (MRI), contrast agents (CAs) such as gadodiamide (Omniscan®) are typically used to improve the visibility of internal bodily structures. NMR spectroscopy, a widely used characterisation tool in the chemical sciences and structural biology, uses the same principle as MRI to obtain images. Gadolinium-based contrast agents are ones that are in regular use in the clinic. 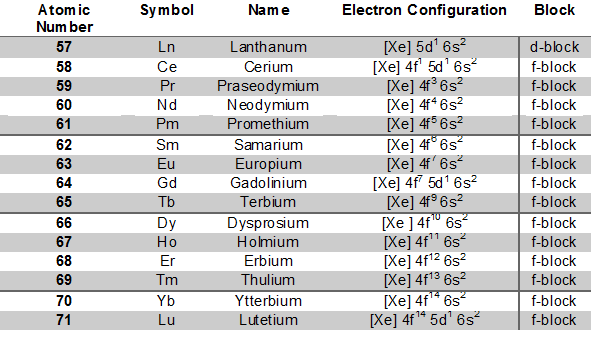 As with the other lanthanoids, an oxidation state of III is common among gadolinium salts. Outside clinical settings, one such application of gadolinium is its use for devices that store computer memory. At the time of writing, the anti-hyperphosphataemic lanthanum carbonate (La2(CO3)3 is the only lanthanum salt that has been approved for clinical use. Hyperphosphataemia is an electrolyte disorder where patients have an elevated level of phosphate in their blood.Following oral administration of La2(CO3)3, La3+ ions are liberated in the stomach which reacts with dietary phosphate. Reaction with dietary phosphate leads to the formation of lanthanum phosphate (LaO4P) in the gut, which is then excreted in the stool, which is thought to contribute to the reduction of phosphate levels in patients with hyperphosphataemia. (1) Cotton, S. A.; Harrowfield, J. M. Lanthanides: Biological Activity and Medical Applications. In Encyclopedia of Inorganic and Bioinorganic Chemistry; John Wiley & Sons, Ltd: Chichester, UK, 2012. (2) Teo, R. D.; Termini, J.; Gray, H. B. Lanthanides: Applications in Cancer Diagnosis and Therapy. J. Med. Chem.2016, 59 (13), 6012–6024 DOI: 10.1021/acs.jmedchem.5b01975. (3) Cotton, S. Lanthanide and Actinide Chemistry; John Wiley & Sons, Ltd: Chichester, UK, 2006. (4) Mittra, E. S. Neuroendocrine Tumor Therapy: 177Lu-DOTA-TATE. Am. J. Roentgenol.2018, 211 (2), 278–285 DOI: 10.2214/AJR.18.19953. (5) He, A.; Zhou, F.; Ye, F.; Zhang, Y.; He, X.; Zhang, X.; Guo, R.; Zhao, X.; Sun, Y.; Huang, M.; Li, Q.; Yang, Z.; Xu, Y.; Wu, J. Preparation and Characterization of Lanthanum Carbonate Octahydrate for the Treatment of Hyperphosphatemia. J. Spectrosc.2013, 2013, 1–6 DOI: 10.1155/2013/593636.